I am studying the distribution of buckthorn in relation to soil calcium and pH. This started because there was an interesting distribution of buckthorn at Pleasant Valley Conservancy which was possibly related to bedrock formations. Pleasant Valley Conservancy is in the Driftless Region of southwestern Wisconsin, which means that there is no glacial drift over the bedrock. Geologist Bob Dott used field observations and well logs from the Wisconsin Geological and Natural History Survey (WGNH) to construct a bedrock map of the Conservancy. Later, the WGNH kindly sent me an unpublished bedrock map of Dane County which was georeferenced so that I could bring it directly into ArcGIS (see abbreviated version of this map, below). In our early restoration work it appeared that buckthorn was everywhere, but as we began to get it under control I discovered that it was much more common on the western (higher) than on the eastern (lower) part of the Conservancy. The top of the property, which has what I call the "Dolomite Cap", was where we were finding buckthorn, and as one moved off the Cap, toward the eastern end, the buckthorn diminished and essentially disappeared. 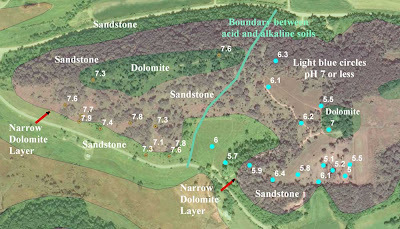 In addition, there is a narrow (20 foot) dolomite layer between the two major sandstone layers, called the Black Earth Dolomite (shown by the arrows on the map). I knew from the work on buckthorn in England (where it is native), that it is found primarily in high-calcium areas. (The English consider this species to be a "calciphile".) Since a major constituent of dolomite is calcium/magnesium carbonate, it seemed reasonable that soil calcium would vary with the composition of the bedrock. Some preliminary work several years ago was encouraging, so this year I have been pursuing this further. I have taken soil samples across the Conservancy, marked their locations with GPS, and had pH values and calcium concentrations assayed (by the U.W. Madison Soil and Plant Analysis Laboratory). The variation in pH and calcium across the Conservancy is very wide, and the distribution is related in a complicated way to the underlying bedrock. All of the soil samples from the dolomite cap area are high in calcium and are alkaline in pH. In addition, the soils on the whole south slope, even those where the underlying bedrock is sandstone, are also high in Ca and pH. This seems reasonable because these south slope soils are riddled with small dolomite fragments, which have come down from the dolomitic outcrops above. (The NRCS soil survey calls these soils "Stony".) Finally, the narrow zone of the Black Earth Dolomite also has soils high in Ca and pH. As the map shows, the east side of the Conservancy, which is away from the Dolomite Cap, has soils that are low in pH, all below pH 7, and mostly below pH 6. In the East Basin, which is the farthest from the dolomite, most of the soils are in the range of pH 5. For anyone interested in the biogeography of buckthorn, these results are intriguing. A good research project would be to study the distribution of buckthorn across southwestern Wisconsin in relation to Ca. I have noticed wide areas of Iowa County that are buckthorn-free. Perhaps this is why? For simplicity, this map shows the pH values, which correlate quite well with the Ca concentrations. A higher resolution version of the above map, in PDF, can be found on my web site. Very interesting research you conducted there... but what do you conclude? Is the distribution normal for that kind of bedrock, or is it out of place? Please, share with us!